Once the consultation and planning phases are complete, G.A. Landscape Design & Associates begins construction. This is an exciting time, since homeowners begin to see our hand-rendered drawings come to life. With a great passion for fine landscape design, our full-service team of construction professionals includes creative woodworkers, master masons, landscape architects and plant specialists. Each has superior expertise in landscape design and outdoor living spaces, which allows them to bring about your outdoor transformation while keeping track of the smallest detail. Minimizing waste, preserving local ecosystems and protecting natural resources are all important parts of sustainable landscape design. G.A. Landscape Design & Associates take your property’s soil type, sun and wind exposure, elevation and native plant life into consideration during every project stage, and construction is no exception. Based on your needs, sustainable strategies may include the incorporation of low-water plants, development of natural shade, attraction of birds and wildlife, and conservation of water and energy. Whenever possible, we use reclaimed materials to reduce waste. We also select our vendors based upon their commitment to recycling and resource management. When possible, our construction team uses sustainable materials and green products that conserve water, protect our natural resources and incorporate local materials, plantings and stone. Upgrading to green landscape design is not only good for the environment; it reduces maintenance and saves you money, as well. 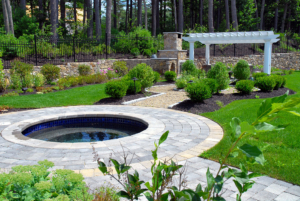 Ask about our commitment to environmental stewardship through eco-friendly landscape design. At G. A. Landscape Design & Associates, our goal is to consistently exceed our clients’ expectations while providing them with unparalleled service. We pride ourselves on delivering a well-designed landscape that enhances the way you look at your home while substantially increasing its value. Once our landscape construction process brings your carefully crafted landscape design to life, consider partnering with us to maintain it. Property management services include mulching, regenerative pruning, plant health care programs, annuals planting and overall preservation of your space. To request a G.A. Landscape consultation, inquire about pricing or speak with a member of our team, call 908.789.1859 or get in touch online today.